It's time for our fifth giveaway! Today I am happy to introduce you to Pavia Designs. 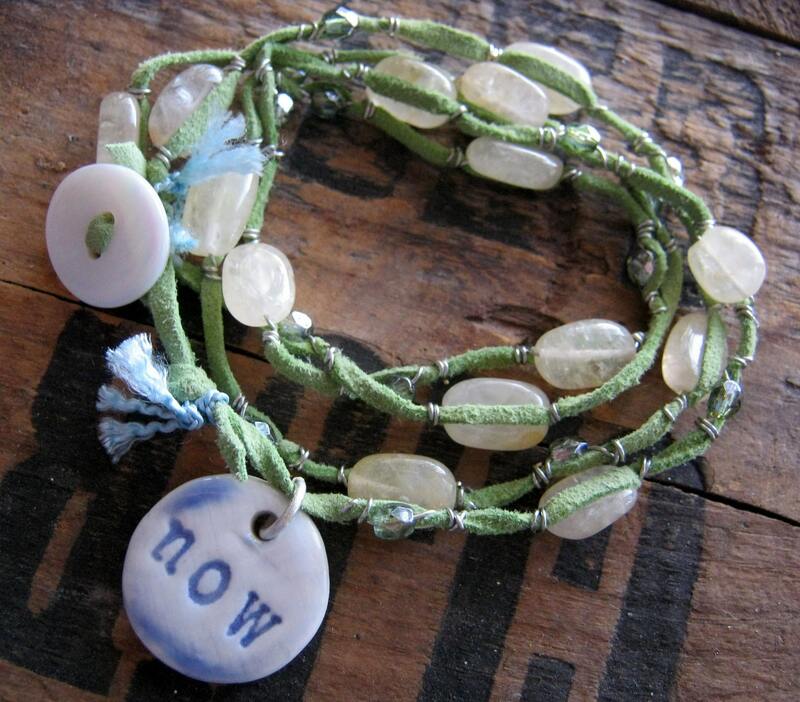 Paula Normand Audette is the creative mind behind Pavia Designs and she creates earth-friendly yoga & inspirational jewelry and accessories. Her items are truly incredible works of art and I am blown away by the creativity and detail. "I have been a jewelry designer for 17 years.I started my career designing high fashion jewelry for Anne Klein which included designing runway jewelry for Couture Fashion Shows in N.Y. I’ve also designed fashion trend jewelry for Guess, Kenneth Cole, and many other specialty retailers." "Three children and a lifetime later I decided to venture in a new direction, creating my own jewelry line using natural and recycled materials to create unique organic looking pieces." "Inspired by nature and a more environmentally friendly life, I integrate these materials with modern design to create one of a kind pieces ranging from modern to whimsical. 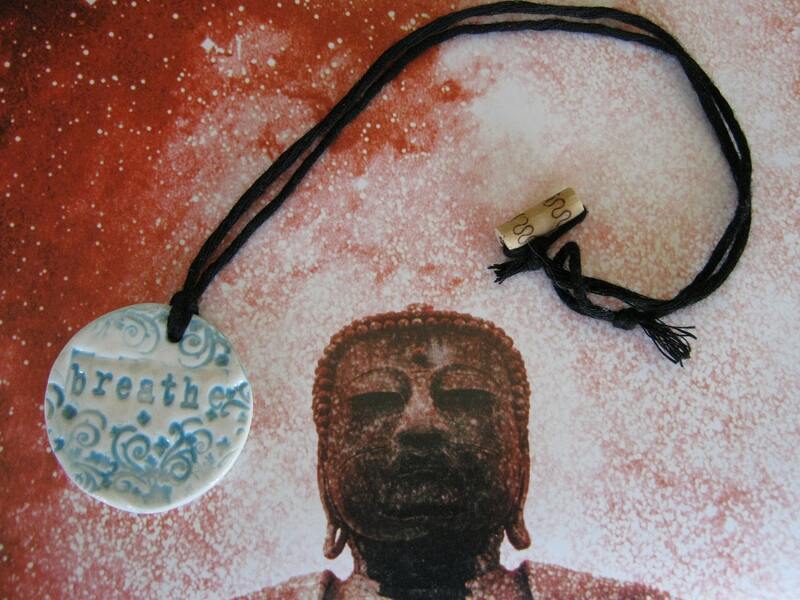 Working with porcelain clay, I stamp each piece with an inspirational powerful word of encouragement. I insert semi precious stones wherever possible because they truly define nature with their organic shapes, variation of color from the earth’s palette and metaphysical meanings. I also use sterling silver wire and metals along with recycled vintage parts I’ve collected over the years." "All of my jewelry is made by hand with special attention given to every detail which ensures the quality and uniqueness of each piece. Residing in the beautiful mountains of Colorado with my family I am happy to be pursuing my passion of jewelry making." 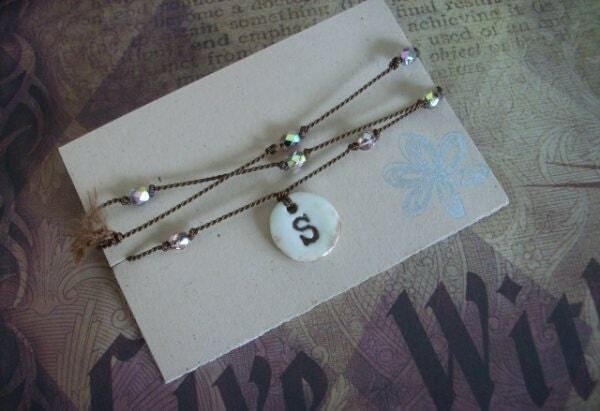 If you haven't checked out her Etsy shop before, check it out now: It's well worth the (virtual) trip. If you're looking for a special gift for someone, or if you feel like spoiling yourself, Pavia Designs has the right item. 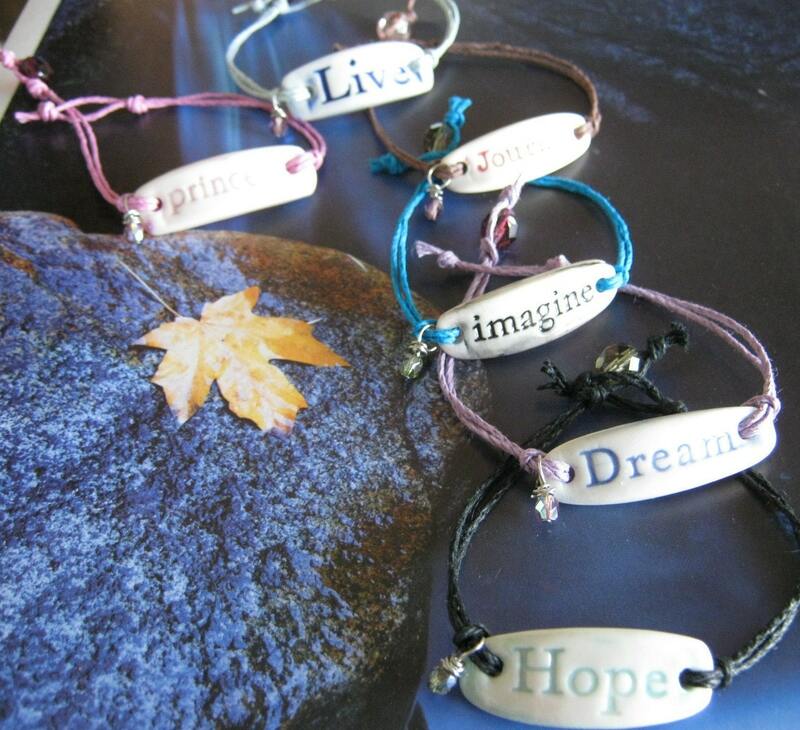 Pavia-Designs has generously donated a beautiful "imagine" necklace. 2. • Leave a comment on the Giveaway post with your primary email address and name (so I can contact you if you win) and tell me HOW you followed me. You must complete the mandatory entry criteria or your entry will be disqualified and deemed null and void. Mandatory entry requirements will equal 1 contest(s)/giveaway(s) entry. If you are already following us by GFC and/or Google+, then just leave a comment with your email and let us know that. This contest will end at 11:59pm on Sunday 1/15/12. Winner will be chosen at random by random.org or by 3rd party of FindingMyWayOm.com's choosing. Contest(s)/Giveaway(s) open to Continental United States Residences Only unless otherwise specified in the contest(s)/giveaway(s) post. Contest(s)/Giveaway(s) ship to Continental United States Addresses Only (No P.O. Boxes) unless otherwise specified in the giveaway post. Entrant(s) Must be 18 years of age or older to enter. Winners will be chosen randomly - Random.org or other 3rd Party. Contest(s)/Giveaway(s) end at time specified in the giveaway post and all entries submitted after the contest/giveaway deadline will be null and void. All contest(s)/giveaway(s) are provided at the discretion of the 3rd party product/service provider(s) and may be discontinued at any time with no product or service being given away. FindingMyWayOM.com is not responsible for any altering of these Rules and Conditions or giveaway(s) on or by other blogs and or websites. Hello, me again, ... Beautiful necklace! ... Rose9565@aol.com ... 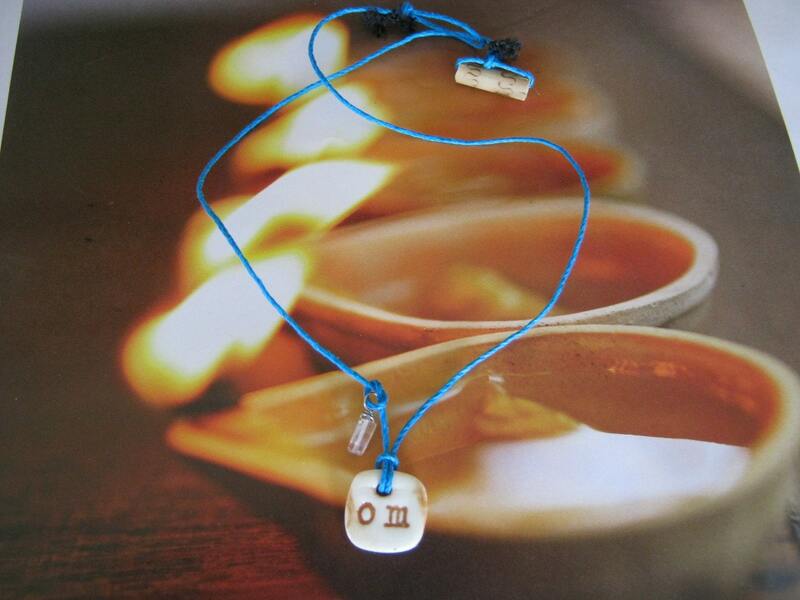 I follow you on Facebook and finding my way OM ... Google too! Good luck all! Very unique and beautiful pieces! Following you via gfc as jhb. Lovely handmade jewelry; especially love the use of recycled parts and the combination of the messages with the organic materials. I am a 'friend' of your blog. Beautiful! And fantastic site by the way! I read, but this is my first comment due to some technical difficulties. Anyway.... Thank you for all that you put together and provide! 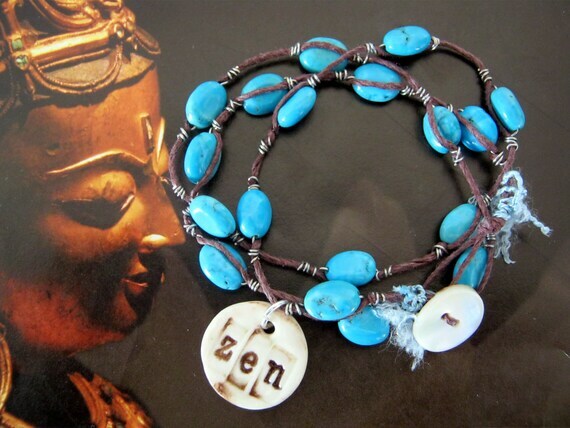 Yoga, jewelry and words: a few of my favorite things! Thanks for the giveaway offer. My email: dorrie@bluesprucejoinery.com I follow your blog via email and google friend. Thanks for all your great insights.